The development of client insight is commonly viewed as a favourable outcome throughout various schools of psychotherapy. While insight has long been a topic of interest in the field of psychotherapy, much about its nature remains unclear. The original research presented here expands existing knowledge of both the content and the underlying process of insight in psychotherapy, with an emphasis on its collaborative co-construction through therapeutic dialogue. This discussion of insight also includes a practical introduction to collaborative language systems (CLS) therapy, which is a postmodern form of psychotherapy developed in the US by psychologists Harlene Anderson and Harold Goolishian. Additionally, the work examines links between insight development in psychotherapy dialogue and the Transtheoretical Stages of Change Model (TTM). Clinical implications for therapists are identified and discussed. 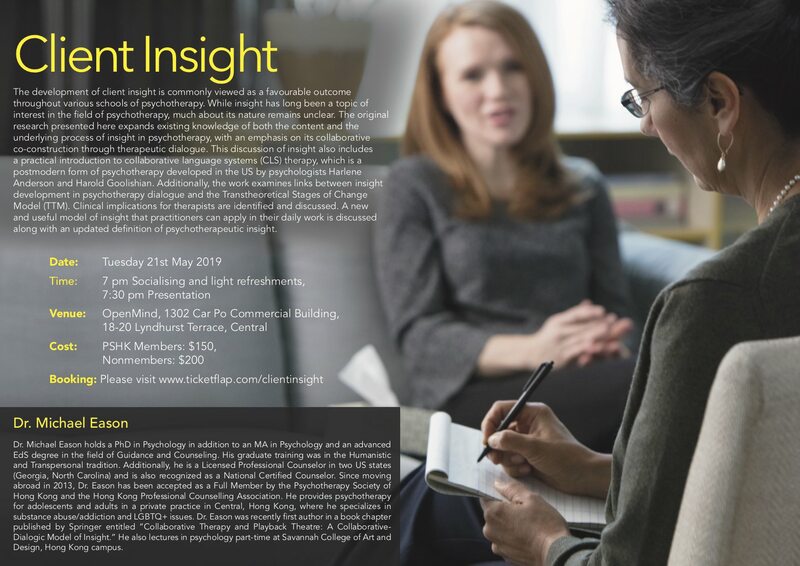 A new and useful model of insight that practitioners can apply in their daily work is discussed along with an updated definition of psychotherapeutic insight. Dr. Michael Eason holds a Ph.D. in Psychology in addition to an M.A. in Psychology and an advanced Ed.S. degree in the field of Guidance and Counseling. His graduate training was in the Humanistic and Transpersonal tradition. Additionally, he is a Licensed Professional Counselor in two US states (Georgia, North Carolina) and is also recognized as a National Certified Counselor. Since moving abroad in 2013, Dr. Eason has been accepted as a Full Member by the Psychotherapy Society of Hong Kong and the Hong Kong Professional Counselling Association. He provides psychotherapy for adolescents and adults in a private practice in Central, Hong Kong, where he specializes in substance abuse/addiction and LGBTQ+ issues. Dr. Eason was recently first author of a book chapter published by Springer entitled “Collaborative Therapy and Playback Theatre: A Collaborative-Dialogic Model of Insight.” He also lectures in psychology part-time at Savannah College of Art and Design, Hong Kong campus.